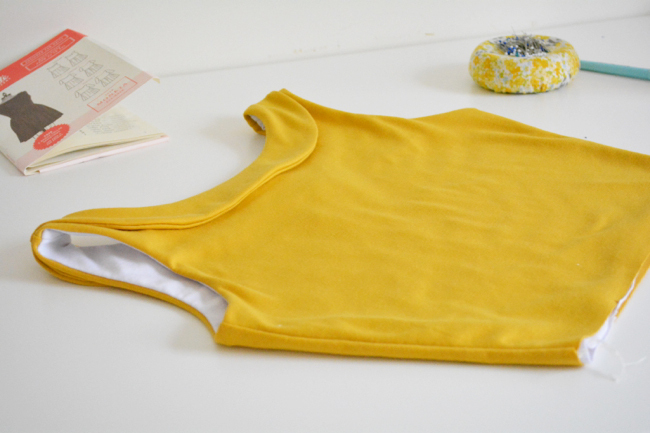 This post covers sewing and attaching the collar for Moneta Version 1. 1) Trim the undercollar. Trim 1/8” from the edges of one collar front and two collar back pieces except for the shoulder seam edges (the shortest edges). These pieces will become your undercollar. Just like with the bodice lining, trimming the edges will help the undercollar stay to the underside. 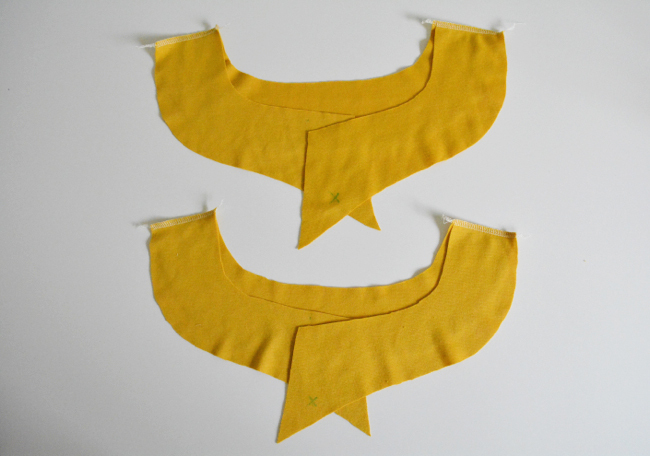 2) Assemble collars. With right sides together, align the two untrimmed collar back pieces with the untrimmed collar front piece at the shoulder seams. Pin and stitch. Repeat with the trimmed pieces. 3) Sew collar. 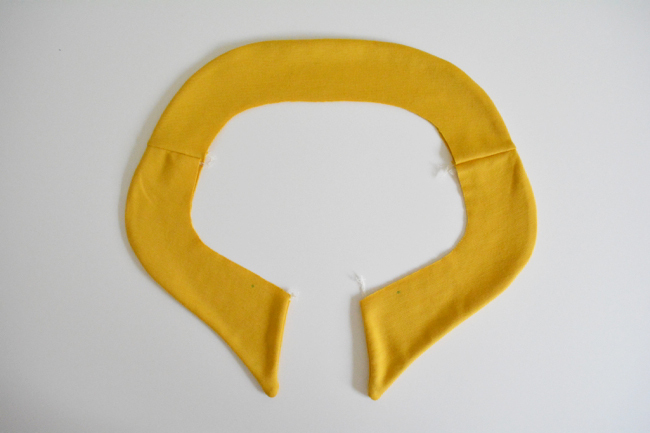 With right sides together, align outer edges of collar and undercollar and pin. Don’t worry about the inner edge at this point. Stitch along the entire outer edge of the collar, starting with a short back edge, going all the way around the outside, and finishing with the other back edge. If you’re using a standard machine, pivot at the back corners when you are sewing them, then clip the corners when you are finished. 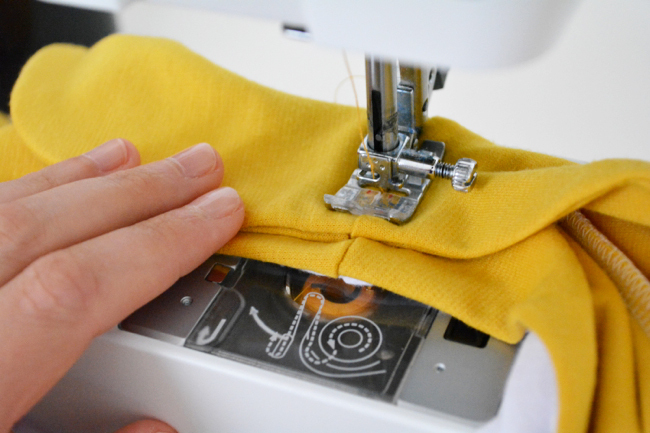 If you are using a serger, sew each side separately. Don’t clip the corners or you will cut through your stitching. 4) Press collar. Turn collar right side out and use a point turner to poke out the points. 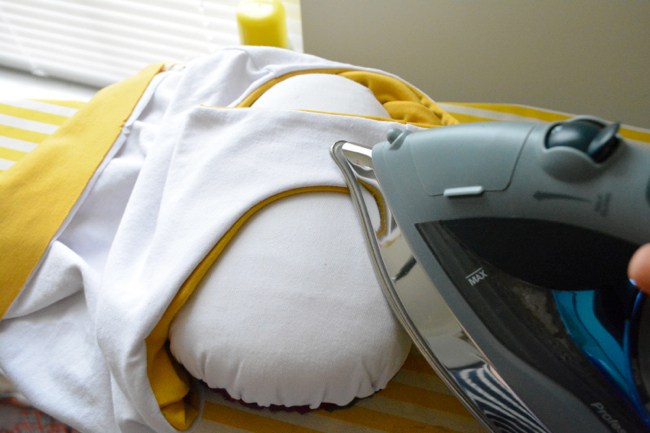 Gently press from the undercollar side so that everything is smooth and flat. At this point, I put a mark on the undercollar to help me remember which one it is. 5) Pin collar to bodice. Turn bodice lining side out. 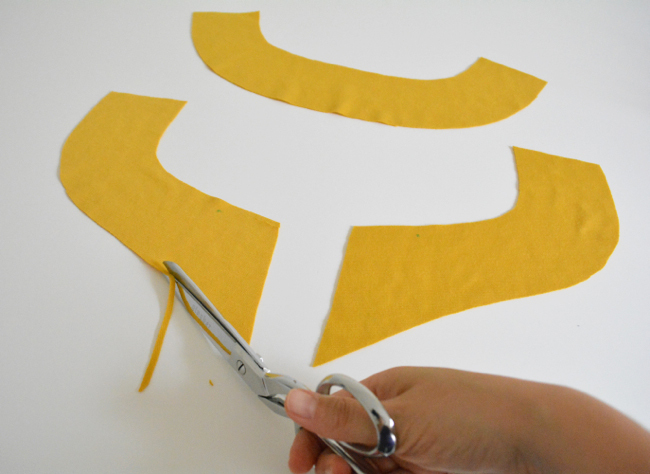 Pin the collar around the neckline of the bodice with the outer collar facing the bodice lining. This means that you should be looking at your undercollar as you pin (mine has a star on it). 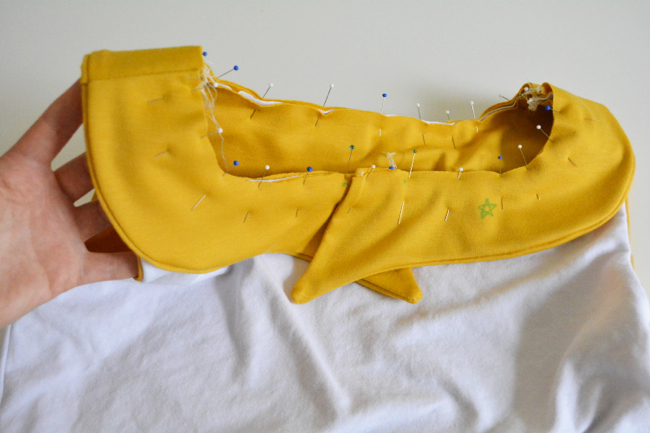 Align the shoulder seams and the dots on the collar with the dots on the bodice. The collar will overlap in the back. Make sure all four raw edges are lined up, including the undercollar’s. If you feel that there are too many layers to manage at the neckline, you can baste the two collars and the two bodices to each other first with a zigzag stitch right along the edge. 6) Sew collar. 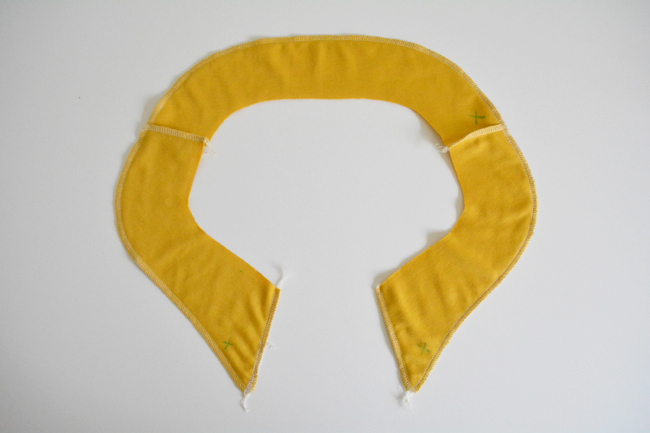 Stitch the collar to the neckline. 7) Finish collar. Flip the collar to the outside of the dress and press gently from the inside. On the shoulder seams, stitch in the ditch to secure collar to dress. It’s ok to use a straight stitch for this seam, since it won’t really be stretching. Voila! Collar attached! On Friday, we’ll get to work on our skirts. Hi Devon! I have a question about the collar. I am pretty late on the sew along and I was wondering if a piping can be added to the outer part. I have never added piping on jersey but as this part of the collar will not really stretch I was wondering if you think it can be done. Thanks! Hm…interesting question! I think if your fabric is stable enough you could try it. I would do a little test swatch first to make sure it lays flat and doesn’t look ripply – would could result from the knit stretching more than the piping as it goes through the machine. But you’re right, it doesn’t need to stretch while you’re wearing it! So I don’t see why you couldn’t try it. An alternative option would be to do a flat piping with knit fabric, which would just be folding a strip of knit fabric in half. 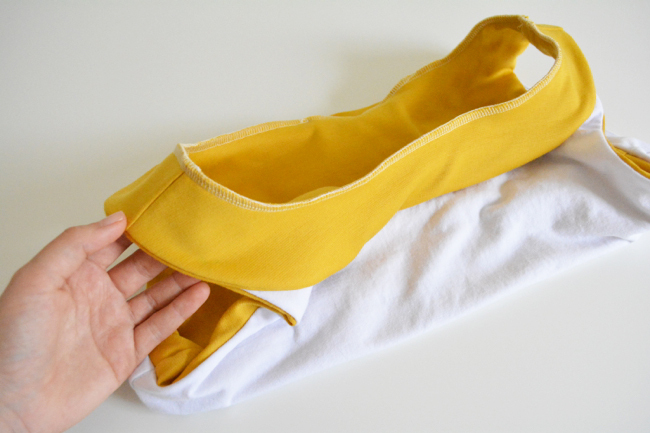 Or you could fill it with elastic cord and make it just like woven piping, except stretchy. Thanks! I thought about the flat piping with knit fabric as well. Will try that and with a piece of non stretchy piping as well. I want to sew version 1 with a contrasting collar, how much fabric should I order for it?